According to Jeep, the all-new Gladiator combines “the best attributes of the Wrangler with the bed of a pickup truck.” Although the brand did turn to the JL generation Wrangler for inspiration when crafting the Gladiator, it feels a bit dismissive for Jeep to make it seem like it’s a Wrangler with a truck bed tacked on. Nothing could be further from the truth. As one of the most hotly anticipated midsize pickups on the market, here’s where the Gladiator stands out: it combines the off-roading abilities of a Jeep Wrangler with the rugged versatility that’s expected of a pickup truck. The Gladiator will easily haul kayaks, mountain bikes, camping equipment – you name it – thanks to its optimal towing capacity up to 7,650 pounds. 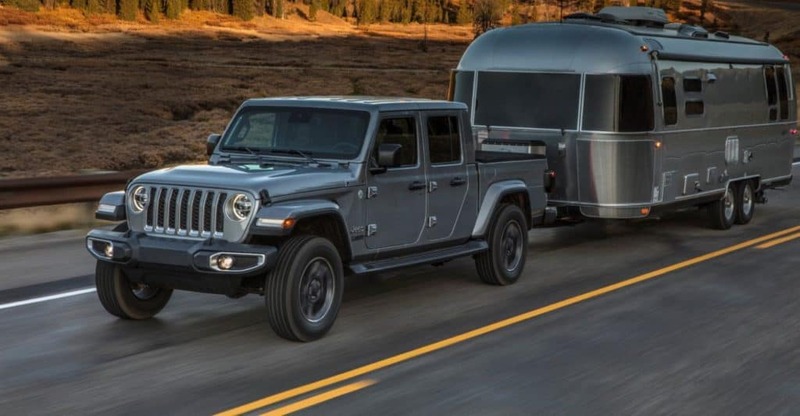 Here’s what you need to know about the 2020 Jeep Gladiator before it rolls across dealer lots this upcoming Summer (2019). Jeep announced that the Gladiator will come in four trims: Sport, Sport S, Overland and Rubicon. On the Sport trim the standard features include Bluetooth hands-free calling with voice command, a 5-inch touchscreen display with the latest Uconnect infotainment system, a USB port, and backup cameras. The trim that follows, the Sport S, will feature all the above-mentioned perks plus make available certain options packages such as the Cold Weather Group and the ability to upgrade to a larger Uconnect touchscreen. From here on out it’s nothing but higher-tier trims – the Overland offers a leather-wrapped steering wheel, a leather-wrapped shift-knob, a wall-style 115-volt power outlet, a 7-inch touchscreen and can be optioned up with heated seats and leather upholstery. The Rubicon offers the same features as the Overland and adds special cameras on all four sides for seeing the trail as the most adventure-inclined pickup of the bunch. A front trail camera mounted on the grille has an integrated washer, so off-roaders will always know what lies ahead. Would a Jeep vehicle be a bonafide Jeep vehicle if it wasn’t trail-rated? Perhaps, but the Gladiator doesn’t skimp on the specs with its aggressive approach angles, its ample ground clearance, as well as Dana 44 axles – all favorites among off-road enthusiasts. The Gladiator Rubicon goes above and beyond as the off-roading variant with its 35-inch off-road tires, Fox off-road shock absorbers, electronic-locking front, and rear differentials, and an electronically-disconnecting front sway bar. The standard under the hood of each Gladiator is the brand’s 3.6-liter V6 gasoline engine that’s capable of generating 285 horsepower and 260 lb-ft of torque. A six-speed manual or eight-speed automatic transmission rounds out the powertrain depending on the buyer’s choice – all with a standard four-wheel drive. This combination offers a payload of 1,600 pounds and a towing capacity of 7,650 pounds, but these aren’t the Gladiator’s only options. A new diesel engine with more than 440 lb-ft of torque is in the works to debut late next year (2020). Jeep fanatics suspected that the brand would name this vehicle the “Comanche” or “Scrambler” as a nod to previous vehicles in its lineup, but that was not the case. The Gladiator name was chosen from a full-size Jeep pickup truck that the brand built from 1962 to 1988 and was one of the vehicles that survived the brand’s many transitions through Willys, Kaizer, American Motors, Chrysler, and now eventually Fiat Chrysler Automobiles (FCA). Additionally, the old Gladiator was the base of various commercial and military vehicles. Follow Hollywood Chrysler Jeep on social media to stay up to date with the latest Jeep Gladiator news – and to know when the pickup rolls across our lot so that you can finally take that test drive! In the meantime, feel free to check out our extensive Jeep inventory so you can witness the brand’s craftsmanship up close and personal. The Jeep Experts at Hollywood Chrysler Jeep will be waiting to assist you – schedule your test drive today!